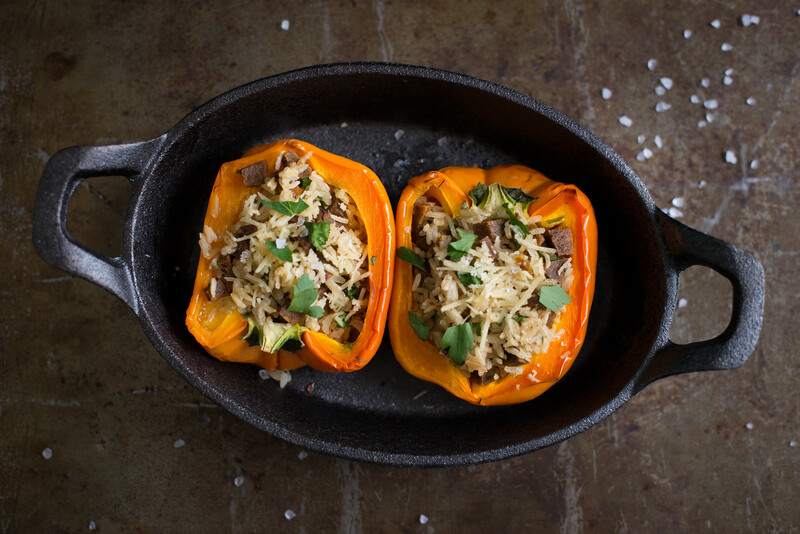 These stuffed peppers make a delicious all-in-one veggie/grain side dish. One time saver is to use a quick-cook brown rice. The other would be to use a coarse bulgar wheat or quinoa which is much faster to cook. I use a flavorful vegetarian sausage, but if you want to use regular sausage, then it can easily be adapted for meat-lovers. Check labels if there is a concern about food allergies or gluten, as many vegetarian sausages have soy and/or wheat. Beans, lentils or other meat substitutes could be used instead. We found a smaller sweet orange pepper in the garden and stuffed this too. It would be a great size for a toddler or preschooler! Heat oven to 375 degrees. Place peppers on a cookie sheet (sprayed with cooking spray) and bake 15 minutes. While peppers are cooking prepare rice according to package instructions using vegetable stock instead of water (if you don’t have enough stock you can add water as needed). In a large skillet heat oil on medium and cook sausage and green onions until softened. Add shredded carrots and zucchini and cook another 5 minutes until softened. Add garlic and parsley, and cook another 2-3 minutes. When rice is finished add it to the skillet and combine with the vegetable mixture. Season with salt and pepper to taste. Loosely pack rice mixture into each pre-baked pepper and bake another 30-40 minutes until pepper is soft. Sprinkle with parmesan and bake another 5 minutes.